. 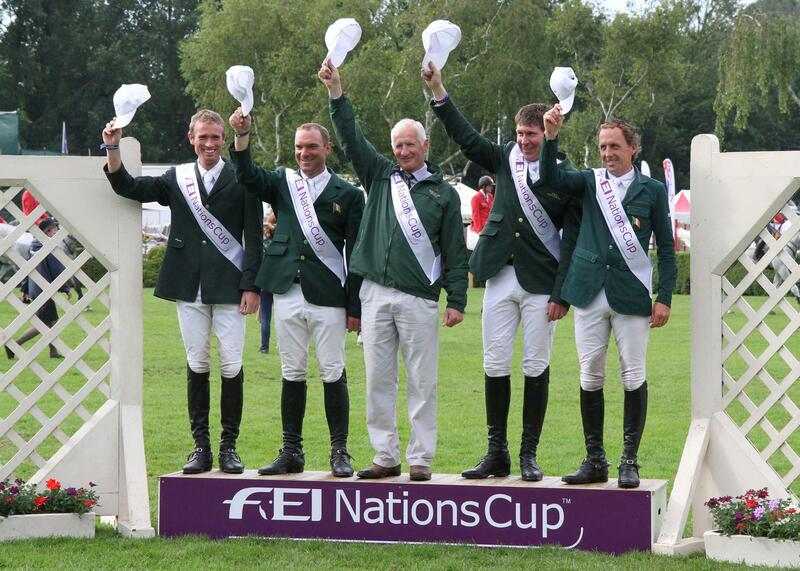 :: IRELAND WIN THE FEI NATIONS CUP OF GREAT BRITAIN ::. Ireland won The FEI Nations Cup of Great Britain at Hickstead today, making it their first win this season and indeed their first FEI Nations Cup win at Hickstead since 2001. The Robert Splaine-led team of Shane Breen (Cos I Can), Richie Moloney (Ahorn Van De Zuuthoeve), Darragh Kerins (Lisona) and Clem McMahon (Pacino) finished on just four faults, beating France in a thrilling competition that went down to the final round. As always the contest ebbed and flowed, with Germany, Ireland and France tied for the lead after the first round of competition. As the event progressed, France assumed control as the final riders went out for the second time. But with Ireland and Germany still capable of winning, the competition was wide open. Germany needed to go clear to put the pressure on the other two, but they faltered. However Ireland threw down the gauntlet to the French, with Clem McMahon, who retired in the first round, jumping clear to put the pressure on Penelope Leprevost. The Irish were guaranteed a jump off, even if Leprevost went clear, and the pressure was heaped on France. However, Leprevost had an early fence down so she retired, with France relegated to second. Earlier in the day there was a exciting renewal of The Bunn Leisure International Stakes, with France's Eugenie Angot and Davendy S winning an enthrallingly-close class. Drawn early in the class, Eugenie then had to watch through her fingers as a series of riders went close to her time. A quicker time was possible, as several proved, but none managed to stay clear, picking up at least four seconds in penalties. Joe Clayton (Antello Z) finished second, with 66.86, with Philipp Weishaupt (China Blue 4) third in 67.23. Five riders finished within a second of Eugenie, but she held on to win. “She's a brilliant horse, naturally quick and I didn't do anything too risky. I think she's very good, I think I'll be back here next year for the Nations Cup on her, so it was nice to win a class like this,” said Eugenie. Numerous showing classes reached their conclusion today at the Longines Royal International Horse Show, the official horse show of the British Horse Society. Katie Bacon won the BSPS Heritage Mountain and Moorland Supreme Ridden Championship with the Connemara pony Galloon Rollover. The Leeman Family Supreme Working Hunter title went to Louise Bell and Into The Blue, a horse formerly ridden and bred by top show jumper John Whitaker. *Photo of Irish team by Julian Portch.